From left, Sharla Moody, Brea McClung, and Alyssa Bennett at the Gallia Local School Board Meeting last Thursday. Braden Young with Principal B randonMitchum. Young has earn a perfect score three years in a row. Luke Santos being presented with certificates for two perfect scores last spring. 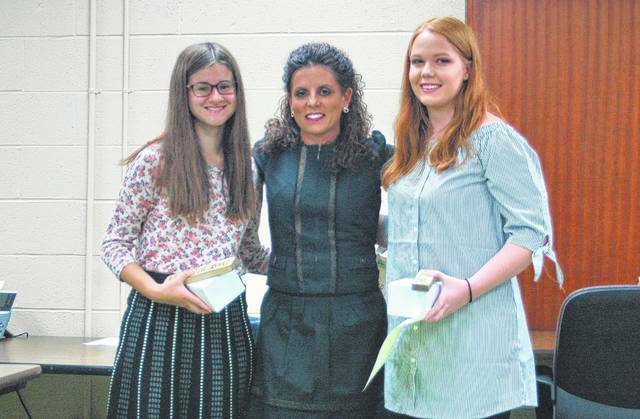 BIDWELL — Four students were honored Thursday evening at the Gallia County Local School Board Meeting for reaching academic success. Two students were from Addaville Elementary, and were recognized for their test scores last spring. 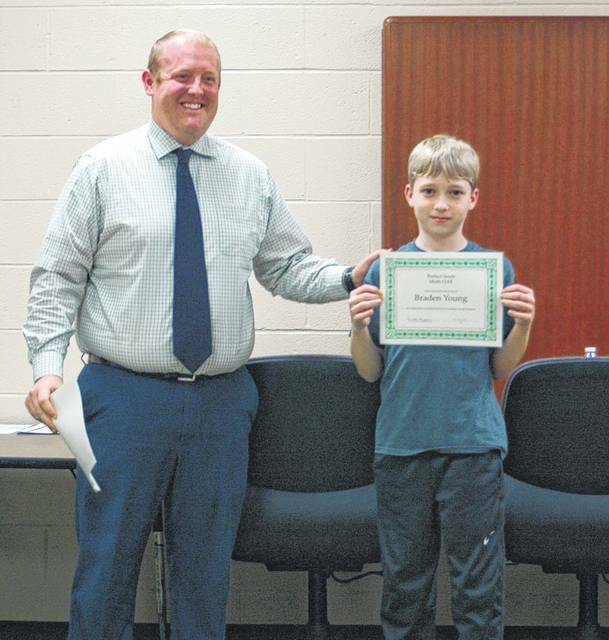 Braden Young earned a perfect score on the math test last year as a fifth grader at Addaville. Luke Santos also scored a perfect score in math as well as science, making this his second year with a perfect score. Young has scored a perfect score three years in a row. 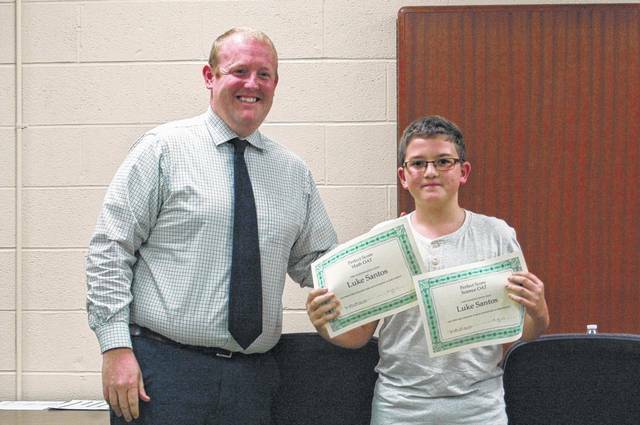 Brandon Mitchem, principal at Addaville Elementary presented both students with awards for their work. “We really miss these guys at Addaville and I’m sure they will do really well at the middle school,” stated Mitchem. Both students are now at River Valley Middle School. Two other students from River Valley High School were recognized for their merits as well. Brea McClung teaches in the history department at River Valley High School and had two students score a five on the Advanced Placement History test last spring. AP tests are scored 1-5, with five being the best possible score. Sharla Moody and Alyssa Bennett earned five out of five on the AP Exam. McClung highly praised them both for their achievements in academia.